1,000 Dreams Fund celebrated International Women’s Day 2018 in amazing style and with a lot of substance in New York City! 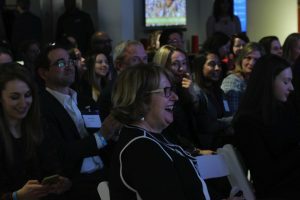 On March 8th, we joined forces with our partner HARMAN, a wholly owned subsidiary of Samsung and leader in consumer electronics and connected technologies for the home, office, and car, to celebrate the advancement of women in STEAM (Science, Technology, Engineering, Arts and Math) with our “Full STEAM Ahead” event! 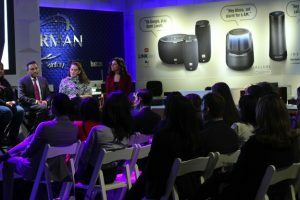 Taking place at HARMAN’s flagship store in Manhattan, the event was kicked off by HARMAN’s CEO Dinesh Paliwal alongside our founder Christie Garton. Each spoke about the importance of supporting young women in their journey towards careers in the arts and sciences. “Progress is being made, but we aren’t there yet,” Dinesh C. Paliwal, President and CEO of HARMAN, shared in his opening remarks. Despite advancements having been made in the last decade, women are still underrepresented in STEAM fields, especially in leadership ranks. According to the Women CEOs of the S&P 500 list, women in top leadership roles across American companies hold just 5.2 percent of all CEO positions with continued underrepresentation in tech, one of the fastest-growing professional occupations in the U.S. Our #NewFaceofTech grant program addresses the importance of helping women early in their careers, to help level the playing field. Our panelists shared personal insights, tips and inspiration for the next generation of STEAM leaders. “Never say ‘no’ to an opportunity,” advised Arthi Chandran while Laura Petrecca encouraged young women to be open-minded about tech fields. “Broaden your perspective,” Laura said. “Don’t underestimate yourself,” added HARMAN’s Sripriya Raghunathan, a top engineer at the company. Mimi Li, Head of Twitch Prime at Amazon, shared how she took a childhood hobby and passion for gaming and turned it into a career. She grew up playing video and computer games, which helped her in her professional development. “I built confidence in games…I learned how to be a leader,” which she now leans heavily on in her unique role at Twitch. There are also a lot of stereotypes about young women in the arts and sciences and it can be easy to get discouraged and to quit. Pomona College student Chinasa Okolo, who won our #NewFaceofTech Challenge last year, encouraged fellow students to forget the stereotypes and forge their own paths. Chinasa used her funding to attend conferences as she continues her path to obtain her PhD and become a professor of computer science. At the end, Dinesh Paliwal was so moved by the efforts of the 1,000 Dreams Fund, he announced that the Ila and Dinesh Paliwal Foundation would donate $10,000 to 1DF as a matching donation to HARMAN’s $10,000 contribution for the New Face of Tech Challenge. Stay tuned for further details on this amazing announcement and how we plan to use these critical funds to help fund and fuel the dreams of even more young women in STEAM. Do you YOU love science or the arts or know someone who does? 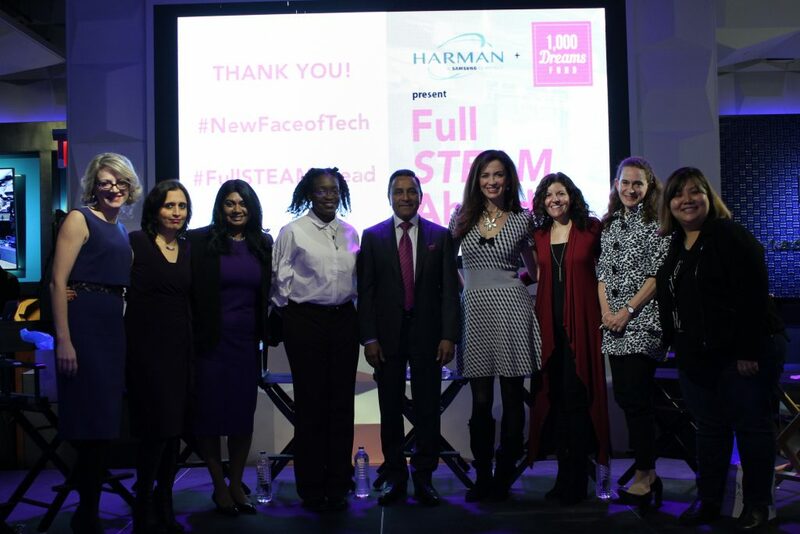 Tell them to enter our #NewFaceofTech Challenge for the chance to get $2,000 in funding for YOUR dreams plus a one-on-one executive coaching session from a HARMAN executive. Who knows? Like Chinasa, maybe we’ll see you speaking on the panel at our next event!